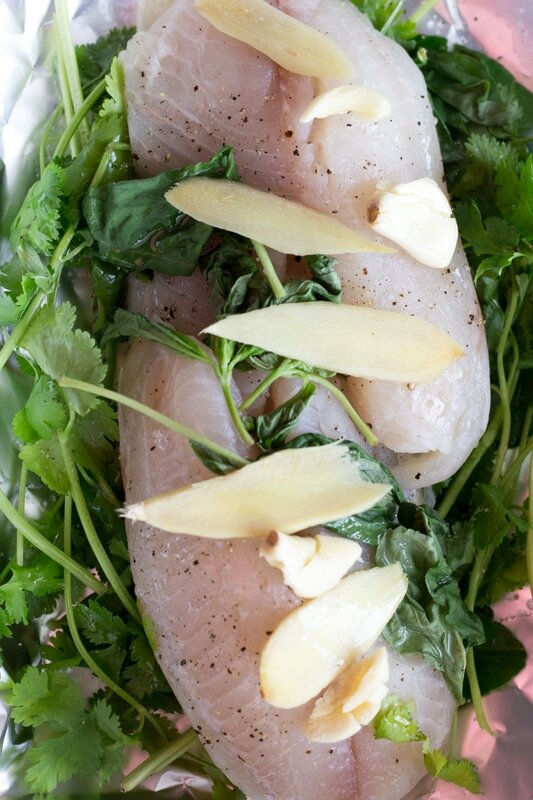 Fresh herbs and aromatics give these Tilapia foil packets a punch of Asian flavor and freshness. Best of all, cleanup is a breeze and they can be made on the grill or oven in less than 30 minutes. Serve them with some cauliflower rice for a healthy and low carb meal. My mom was in town and we were having my husband’s family over for dinner. Initially we wanted to make a fried fish, but decided that something baked or in a foil packet would be better for my Father in law, who has dietary restrictions. Since he can’t have a lot of sodium, the best way to impart flavor is to use lots of fresh herbs and aromatics. We went to the Asian market and got fresh basil, lemongrass, ginger, cilantro, and garlic, then decided to do foil packets with Tilapia over the grill. We are a family of spice, so of course my mom had to make a Thai ‘Salsa’, or nam jim. The salsa consists of lots of Thai chilis, garlic, cilantro stems, lime juice, and fish sauce, then blended to make a sauce. This sauce was ridiculously spicy, but somehow we enjoyed it! This is also the day that we made 50 spring rolls and pretty much finished them between the 8 of us. Probably because our mouths were on fire from the Thai chilis. 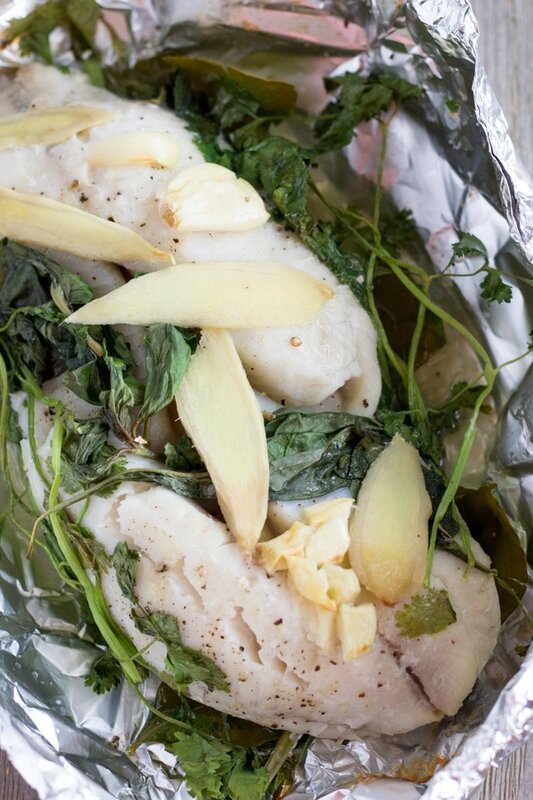 The first time we made the Tilapia foil packets on the grill and this last time I made it in the oven. Both ways turned out delicious, so it’s really your preference on how you want to cook it. You can check on the fish after 25 minutes, and once it’s flaky and white, then it’s ready. I served the fish with cauliflower rice and some of the cooked herbs on the side. Be sure to serve some of the juice that’s leftover in the packet too, its packed with flavor! Preheat oven or grill to 400 degrees. Season both sides of fish with salt and pepper. Use heavy duty foil for the packets, divide herbs into 3 batches. Place one layer of herbs and aromatics on the bottom, then place 2 seasoned filets, top with more herbs, top with 2 remaining filets and herbs on top. Seal packet tightly and bake for 25 minutes. 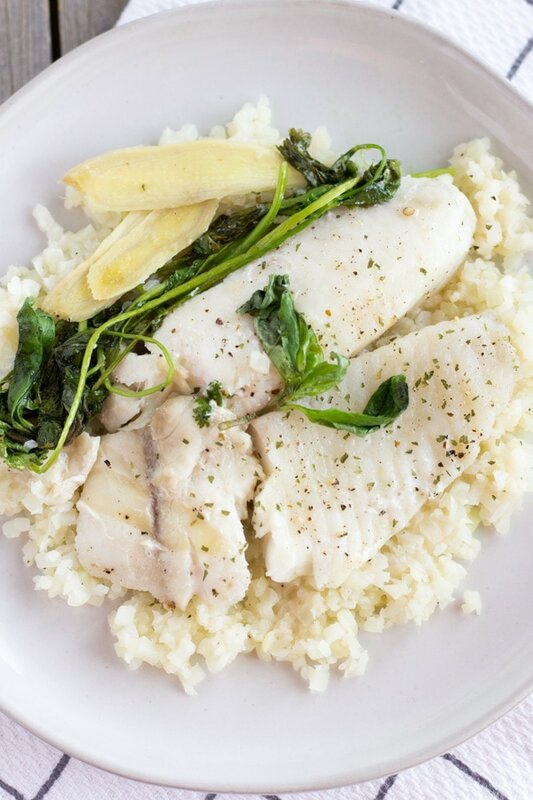 Test the fish with a fork and once flaky and white, then it's done. Serve with rice, some of the cooked herbs, and juices from the packet.